The twins Apollo and Artemis are being much talked about in the world of fancy colored diamonds. Blue for a boy and pink for a girl, Apollo and Artemis are a pair of pear-shaped “divine diamond twins”, named after the celestial twin brother and sister to symbolize their great power and beauty. Perfectly matched in size, cut and tonality, and mounted as a set of stunning earrings, the Apollo Blue and the Artemis Pink sold together for $57.4 million this May at Sotheby’s Geneva Magnificent Jewels and Noble Jewels sale. 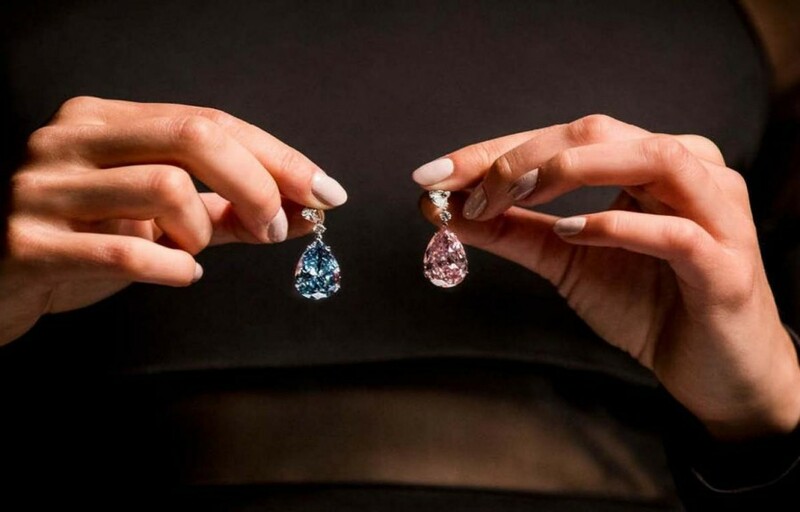 These two highly anticipated rare colored diamonds, viewed at pre-sale exhibitions in Hong Kong, London, Dubai and New York were setting records before they ever went under the hammer, billed as the most valuable pair of diamond earrings ever to appear at auction. 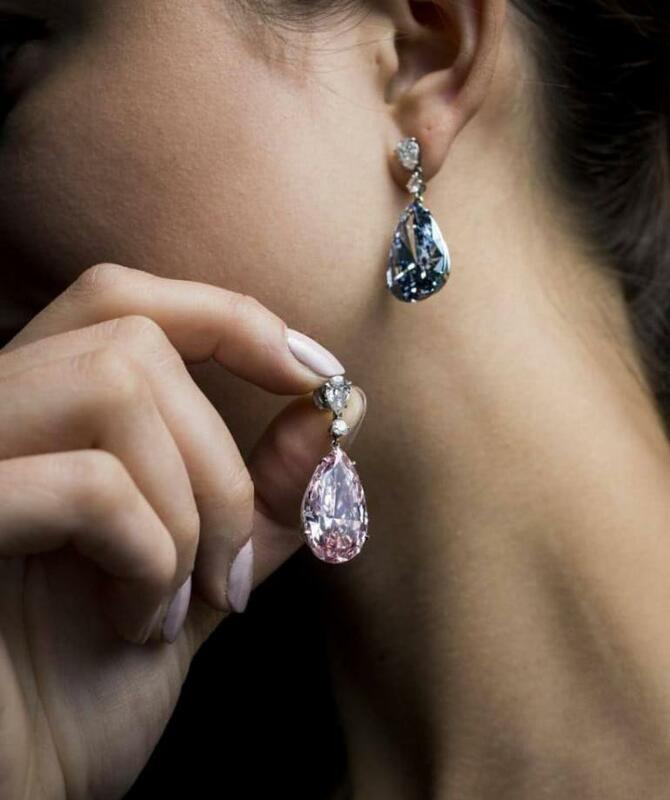 Although set as a pair of earrings, the ‘Apollo Blue’ and ‘Artemis Pink’ were offered on separate lots on due to extreme rarity and value of both natural colored diamonds. Both colors are amongst the rarest of the rare colored diamonds, occurring in less than 0.1% of all natural colored diamond. The “Apollo Blue”, a 14.54 carats, an internally flawless fancy sold for $42.1 million, becoming (as anticipated) the highest selling lot of the sale. Its pair the “Artemis Pink”, a 16.00 carats fancy intense pink diamond, sold for US$15.3 million, the second highest selling lot of the auction. Sold together for a phenomenal $57.4 million, the pair set a record for the most expensive earrings ever to be purchased at auction. The Apollo Blue also holds the record for the largest internally flawless fancy vivid blue diamond ever to be offered at auction. 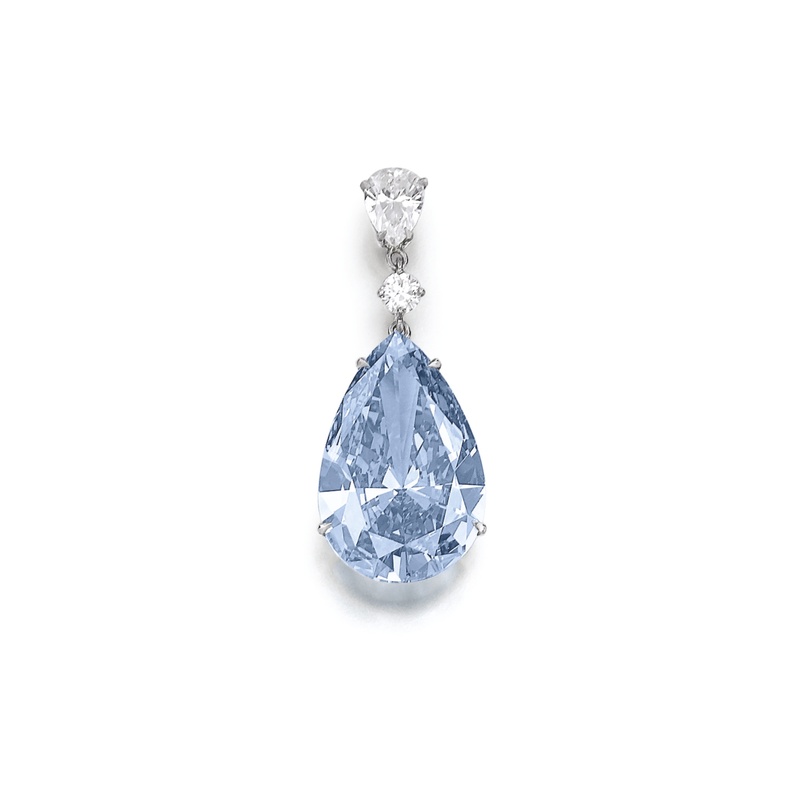 Lot 377: the Apollo Blue diamond Pear-shaped, Fancy Vivid Blue, Internally Flawless, 14.54-carat diamond mounted on platinum as a pendant earring, from a surmount consisting of a pear-shaped and round brilliant-cut colorless diamonds. 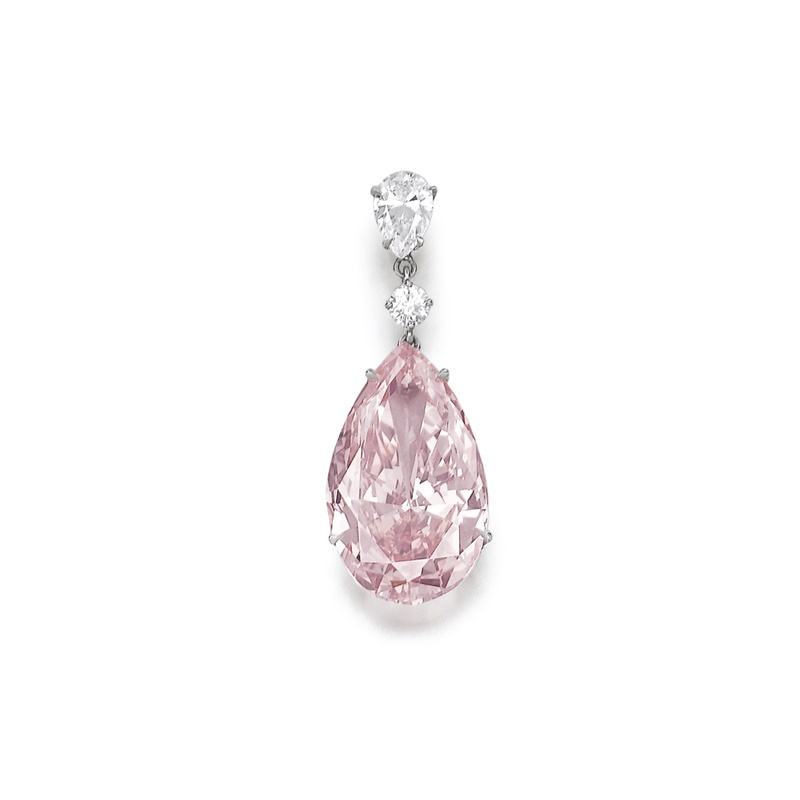 Pear-shaped, Fancy Intense Pink, VVS2 Clarity, 16.00-carat diamond mounted on platinum as a pendant earring from a surmount consisting of a pear-shaped and round brilliant-cut colorless diamonds. 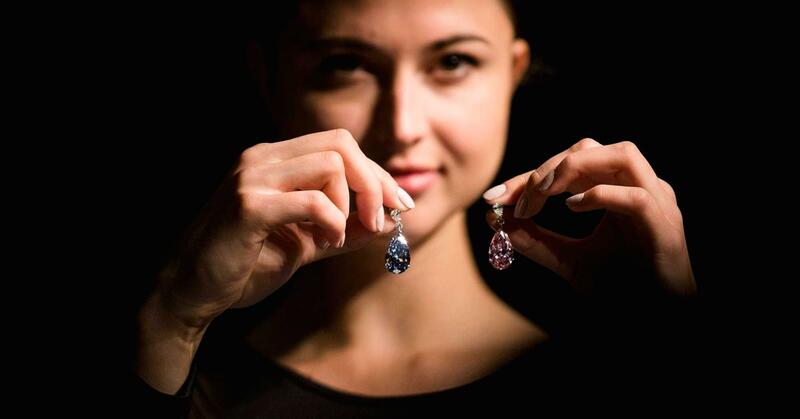 Although they appeared in separate lots as individual colored diamonds for sale, the divine twins were destined to stay together, and after competitive bidding were purchased by the same anonymous buyer who has now rechristened them The Memory of Autumn Leaves (blue) and The Dream of Autumn Leaves (pink). The chairman of Sotheby’s international jewellery division David Bennett said he was ‘delighted’ the earrings would remain together. Asteria Diamonds has been in the luxury diamond business for over 50 years, creating personal relationships with our clients and producing only the highest quality colored diamonds and jewelry. In the last decade we have gone in new directions with our website and jewelry lines, but remained dedicated to customer satisfaction. Learn more about us and our products at asteriadiamonds.com. Which of The Colored Diamonds is Most Expensive?